Users of the privacy-focused DuckDuckGo will be seeing local search results with Apple Maps integration, the search engine has confirmed, with the integration of MapKit JS being used both for location-based searches as well as the Maps tab. The addition of Apple Maps to DuckDuckGo, which affects both desktop and mobile usage, replaces the previous map-based results that used OpenStreetMap. The change brings DuckDuckGo's map offering closer to what is offered by Google and Microsoft's Bing, but instead is provided through Apple's service. 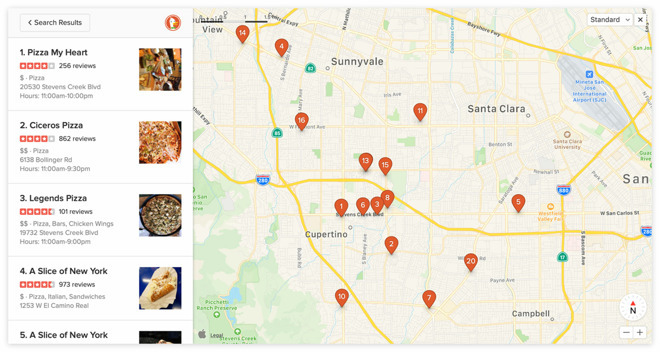 Described as one of the "first global companies using Apple MapKit JS," DuckDuckGo now offers improved address searches, enhanced satellite imagery, and continually updated maps to its users. When searching for a specific area, a map module will appear showing the location of results which can be expanded for more details. "We're excited to work closely with Apple to set a new standard of trust online, and we hope you'll enjoy this update," writes DuckDuckGo. Apple announced at WWDC 2018 in June it would be providing access to the MapKit JS framework to embed maps within a website to developers, expanding the existing MapKit to allow it to work within a browser. Technically in beta, there is a free-usage limitation of 250,000 map initializations per key per day that developers must work within, as well as a further limit of 25,000 service requests covering geocoding and searches per day, though developers are able to contact Apple if higher allocations are needed. It is highly likely that DuckDuckGo contacted Apple about using MapKit JS with a higher allocation, but it is unclear if the access is being paid for, and if so, how much it costs. Nice. DDG didn't have much of a choice did they? 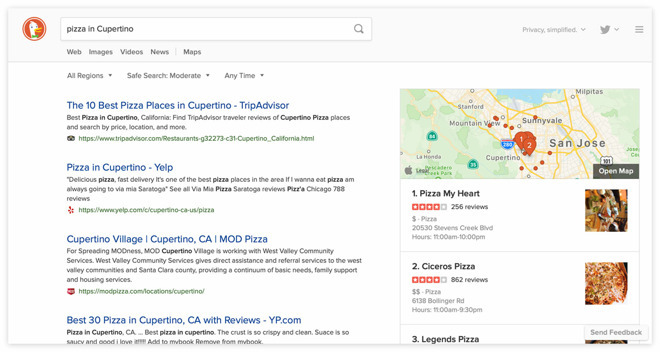 Well, Maps don't load within a DuckDuckGo search (only a grid is shown with location markers for pizza places in my town...thought I'd try the same type of search as in the article) for either Safari or FireFox on my Mac running El Capitan. I wonder if this move to the MapKit JS framework is macOS specific? I searched "mall" and Apple Maps showed up in Windows using Chrome. Great news all around on this one. Works flawlessly on Mac and Windows using Safari/Edge/IE. I avoid Chrome like the plague it is. Same here. I also avoid Windows but I was at work using their crap. This is great news. Since Apple's own products (Maps/Siri) are almost worthless at search (although directions are fine, interface is great), it's nice to have an alternative that will help me continue to avoid google/bezos/microsoft. In an ideal world, the most valuable (until recently) public company would have their own viable option after 1/2 a decade in development. Many used to suggest that Apple start their own search engine. Maybe buying DDG would be a good way to jumpstart that?